What's happening next at Midway Village? You can see all of our upcoming events at a glance - just download our 2019 Calendar of Events in PDF format (approx. 2.3 MB, opens in new browser window). Where do I start my visit? The Main Museum Center begins your visit to the museum campus. A museum representative will greet you at the Front Desk when you arrive. 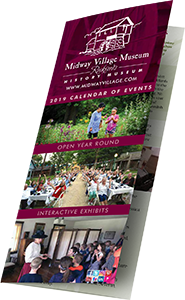 What is Midway Village Museum? Midway Village Museum is a history education institution with learning opportunities for everyone. At the museum, visitors experience history through special events, exhibits, and school programming. Located in Northern Illinois, seasonally an outdoor living history museum representing rural life in the early 1900s is available for interpretive tours and is host to many award-winning events. The museum is situated on 148-acreas offering a scenic campus atmosphere for those visiting. When is the last tour of the Victorian-era Village during its seasonal hours? 3 p.m. is the last guided tour of the Victorian-era Village during its season hours of operations. An interpreter in period costume will greet you at the General Store in the Village. Admission is paid in the Gift Store located in the Main Museum Center. Are guided tours available of the Heritage Gardens? Midway Village Museum’s Garden Historian may lead visitors through a tour of the vegetable and flowering gardens many of which are heirloom plant varieties. For a tour, call Caitlin Treece, at 815-397-9112, ext. 106 or educator@midwayvillage.com. Do visitors go inside the buildings while on tour? Tours are guided by interpreters who explain life in the early 1900s in rural Northern Illinois. An emphasis is also placed on Rockford’s early growth in industry and Northern Illinois. Tours last approximately one hour and visitors have the opportunity to tour the inside of many of the building that comprise the Victorian-era Village including a hospital, bank, hardware store, police station and residential homes depicting various social structures of that era. Are hotel packages available for visitors? A special $89 rate is available to Midway Village Museum visitors at several area hotels. Accommodations and hotel amenities vary. Please contact hotels directly. For a complete list of partnering hotels click here. Where is the Midway Village Museum? Can school groups tour the museum? Midway Village Museum’s Education Department offers a full spectrum of tours that meet Illinois Learning Standards. The Curator of Education will work closely with school groups to plan tours that meet the needs of educational curriculum goals. Are costumed people in character? Guided interpreters are in both first person and also provide some third-person narrations. During special events, the interpreters generally are in first person. Parking is free for visitors with ample parking available. Adjacent parking is occasionally necessary for larger special events and is also free. Visitors are encouraged to look for signs regarding parking when arriving to special events.